7244 Atlantic, Miami Park Association, South Haven. Fresh and easy is the Bluewood. This home features an easy open floor plan, beautiful finishings and comfy furnishings. The décor is soft and comfy with a bit of a modern flair. The home is a great balance of classic home design with modern conveniences like WiFi and Apple TV for fun movie watching. Bluewood is part of the Miami Park development with a shared beach at the end of the road. Included with your rental are passes for the beach tram, making access to the lake even easier (and more fun!). Enjoy the outdoor space with a dining deck and gas grill, and in the evening enjoy a campfire in the fire pit. Summer Weekly Rentals begin or end on Fridays. The moment we stepped in the door we felt welcomed and like we were "home". Fire pit was a nice plus and the area is nice to walk. Easy access to beach. We enjoyed every day. Friendly, courteous, quick response to our questions. The ladies I spoke with when booking were really nice and helpful. The property was nice and clean. 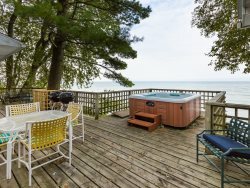 I have stayed in a rental in South Haven before and that property was better I thought. The outside land was really nice along with fire pit area was bigger and nicer. It wasn't so woodsy feeling even though there was a running stream and lots of trees in back it still gave you a more open feeling. The layout was nicer as well. I did like this house a lot and would recommend it to people though. The semi-private beach was fantastic. Definitively a plus for this property. My communication was primarily via internet and phone and the sales people were very helpful. We had a wonderful time. It would have been nice to have had another hour or two in the morning. We felt a little rushed. Very helpful in recommending eating places and activities. Overall, we had a great experience and would return. Very responsive to all needs communicated. Beautiful house with a nice beach.